Eagle Ridge GM | Blog | Mid-Engine Corvette in the Works? Mid-Engine Corvette in the Works? The Corvette is Chevy’s pride and joy. It’s the sports car that took its roots from European heritage and carved out a name for itself by slowly becoming the track monster it is today. Its famously held strong on its American, blue-blooded heritage as a RWD, front-engine track star, dismissing European sports car pressure to move the engine behind the driver. Yet, the mid-engine Corvette nearly became a reality in the early 1970’s — and fast forward to 2018 — there are many rumours, significant talk, and even spy photos that show Chevrolet may be toying with the idea of making a monumental change to its beloved Chevy Corvette Vehicles with a mid-engine layout. We’ve been busy exploring the history behind this debate, investigating the pros and cons between both configurations, and here, we’ll give our two-cents on what the Corvette could stand to gain. The Corvette is the brainchild of Harley Earl and Zora Arkus-Duntov, the ladder would become known as the father of the Corvette. Zora was a Belgian 24 Hours of LeMan racing champion, and a legend of Chevrolet performance parts. Zora joined Chevrolet after seeing the Corvette in 1953 in New York City, and joined the company first as an assistant staff engineer, then Director of High Performance, and then was responsible for introducing a small block V8 and fuel injection into the car in 1955 and 1957. Following these innovative and technological breakthrough additions to the car, Zora built an experimental Corvette prototype called the XP-882 in 1969, which featured a mid-engine layout – smashing the Corvette’s existing — and still present to this day— reputation as a blue collar, front engine, rear-wheel-drive American muscle car. Chevy General Manager, John DeLorean, ultimately halted the project, but brought it back from the dead to dampen the media frenzy created by Ford’s new mid-engine Pantera in 1972. 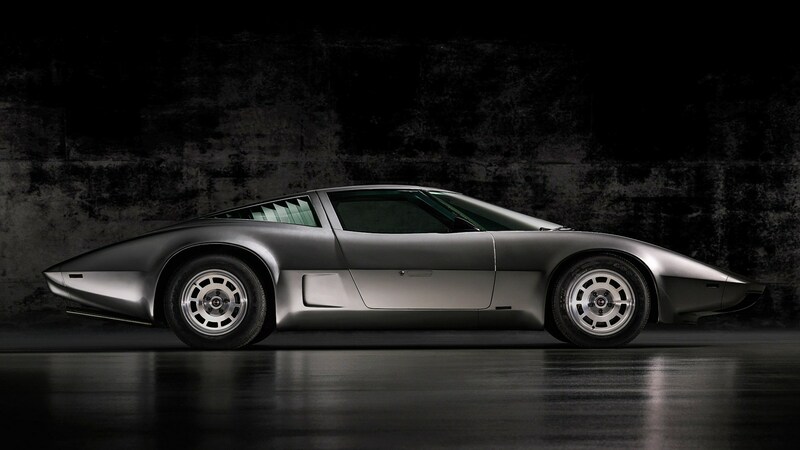 DeLorean’s refurbished XP-882, nicknamed the AeroVette, featured a unique, and reportedly savage-sounding, four-rotor Wankel rotary engine producing 420 horsepower — blowing the stock 5.7L V8 from the 1969 C2 Corvette’s 300 horsepower out of the water. Had this mid-engine rotary beast actually made it to production, would have seen the Corvette more staunchly compete with the exotic likes of Ferrari, Porsche, and Lamborghini. The new DeLorean-bred XP was shown at the 1973 Paris and Chicago motor shows as more of a media darling than a serious contender. It was scrapped for good in 1973 when Chevrolet also decided to cancel their rotary development program, and the Corvette seemed destined to remain as a front engine, rear-wheel-drive vehicle for cost reasons. Mid-engine Corvette revival tales are the stuff of legend, and have been circulating for decades in the forms of reported spy photos, renders, and leaked info from supposed GM execs citing the mid-engine layout of a Chevrolet Super Car. In 1986, Chevy premiered the Corvette Indy, complete with a mid-engine twin-turbo V8 with all-wheel-drive. In 2002, cousin brand Cadillac showed off the Cien, complete with a 7.5L mid-mounted V12, and finally in 2004, Chevrolet executives decided the Vette was as good as it was going to get with the current front-engine rear-wheel-drive configuration, and even went so far as to develop two full scale clay models of a mid-engine Corvette before the 2008 financial crisis and eventual Chevrolet government bailout happened, cancelling the project yet again. Finally, as a cherry on top, there are also rumours pulled from some internal GM documents that say Chevrolet’s working on a unique 6.2L dual overhead cam V8, probably taking notes from the Lotus-developed DOHC Corvette V8 from the 1990-1995 LT5 Corvette. They’re not going to put that engine in just anything, especially something that can’t effectively put an estimated 650-700 horsepower to the ground. A 2016 report also notes a hybrid version is also a possibility, hearkening’ inspiration from the Porsche 918 Spyder and McLaren P1 and enabling all-wheel-drive. Mid-engine Chevrolet prototypes are being tested in southwest Michigan, so let’s safely assume there’s something massive brewing with the Bowtie crew. Further, Road and Track photographers caught these mid-engine proto’s testing with the new 2019 ZR1 Corvette, and the Porsche 911 Turbo S, meaning Chevy could be benchmarking their new car as a usable everyday Super Car. The main advantage of jumping ship and configuring the Corvette with the engine behind the driver, is performance. Corning grip and therefore, speed, as well as optimal weight distribution are the key pillars of mid-engine layouts, religiously followed performance pillars of Chevy’s European sports car rivals the current Corvette simply can’t match. Better weight distribution equates to increased turn-in and corner holding speeds, which translates to accelerated speed. Is it going to happen? We’re not sure, but the rumours, photos, speculation, and ideas cooking up at Chevrolet all point to yes. If it does manifest, the mid-engine Corvette will not only be a game-changer for the American sports car, but it will revolutionize American competition in a global Super Car market dominated by European and Japanese icons.